So you’ve already got artistic skills? Show them off to the world with Intuos Art. Paint, design, and create with a pressure-sensitive pen on a digital canvas. ΠΡΟΣΦΟΡΑ! ΕΚΠΤΩΣΗ 10% έως εξάντλησης του αποθέματος (η έκπτωση έχει υπολογιστεί στην αναγραφόμενη τιμή). Achieving Your Creative Dream. You’re Only An Intuos Away. Unleash your creativity with the new Intuos. Whether your dream is starting your portfolio, racking up some ‘Likes’, or pushing the limits of creativity, Intuos has everything you need to make it happen. 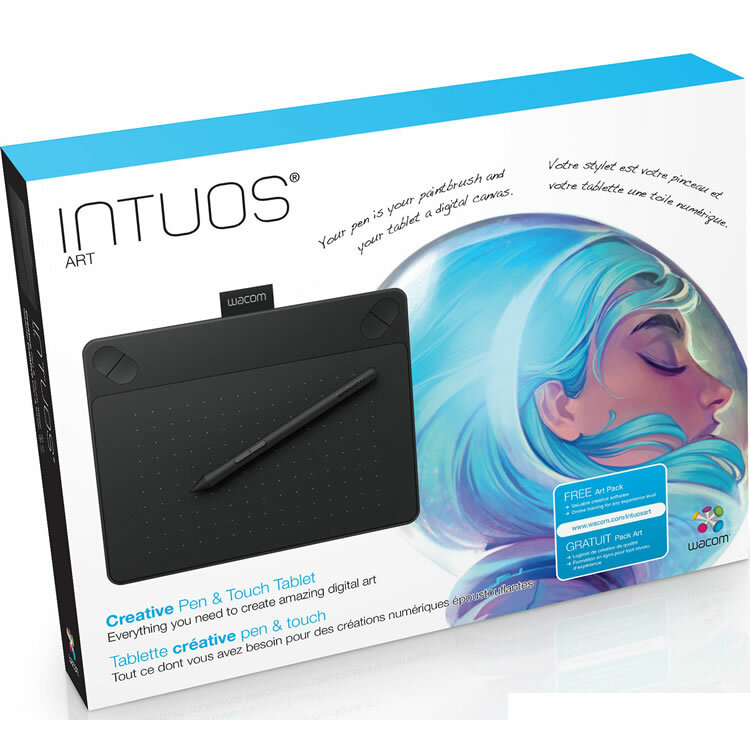 Intuos is a beautifully designed, easy to use pen tablet. Draw, sketch, paint, and edit with natural feel and movement. The pressure sensitive pen, responsive tablet and customizable ExpressKeys™ put a whole new digital toolbox at your fingertips. Voucher for MyPhotobook*: Receive a voucher worth € 20 / GBP 15/ CHF 24 / 150 SEK / 150 DKR for Photo Books, Real-Photo Books, Calendars, Posters, Canvases and Alu Dibonds at MyPhotobook. FREE 30-day lynda.com Membership: Make the most of your software and Wacom tablet with a FREE 30-day membership from lynda.com, an online training library offering thousands of expert-taught English training videos in software, creative and business skills. Access more than 30 hours of Wacom videos— broken into short convenient lessons – plus courses on Photoshop, SketchBook Pro, Corel Painter and more. FREE 30-day video2brain Membership: Make the most of your software and Wacom tablet with a FREE 30-day membership from video2brain.com, an online training library offering thousands of expert-taught Spanish, German and French training videos in software, creative and business skills including Photoshop, SketchBook Pro, Corel Painter and more. *The myphotobook offer is available to all end users ('End User') resident in and with an address for delivery in the following countries (Austria, Belgium, Switzerland, Denmark, France, Germany, Ireland, Italy, Luxembourg, Netherlands, Spain, Sweden, United Kingdom) who purchase a new Wacom Intuos Draw, Intuos Comic, Intuos Photo or Intuos Art tablet.